AP AGRICET Application form download for BSc Agriculture Entrance Test 2019: Acharya N.G. Ranga Agricultural University, Hyderabad would issue the Andhra Pradesh ANGRAU AGRICET 2019 Notification in May, 2019. Acharya N.G. 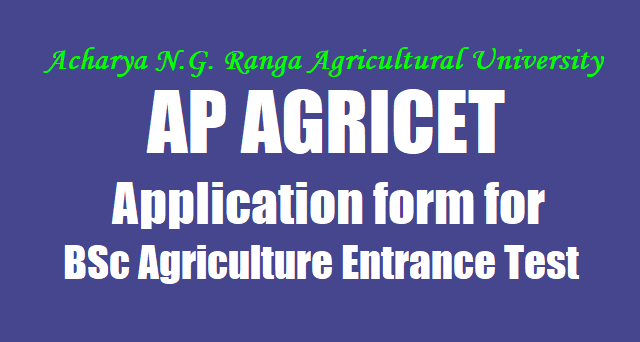 Ranga Agricultural University invites applications from Diploma holders in Agriculture and Seed Technology for admission into four years B.Sc. (Ag.) Degree programme through AGRICET 2019 for the academic year 2019 -20. So, Eligible and interested candidates may apply for this notification. a. The candidates may apply for admission in prescribed proforma along with a Demand Draft for Rs.500/-(Rupees five hundred only) for General Candidates and Rs.250/- (Rupees Two hundred and fifty only) in case of SC, ST & PH candidates DD draw in favour of Comptroller, ANGRAU, payable at Guntur. Completed Application in all aspects along with 2 self addressed envelopes affixed with Rs.5/- postal stamp must reach by 5.00PM on or before 22-06-2019, either in person or by post to Convenor, AGRICET 2019, Office of the Associate Director of Research, Regional Agricultural Research Station, Tirupati – 517502. The candidates may also submit their Applications with late fee of Rs.1000/- (Rupees one thousand only) for General Candidates and Rs.500/- (Rupees five hundred only) for SC,ST& PH candidates DD draw in favour of Comptroller, ANGRAU, payable at Guntur from 25.06.2019 to 30.06.2019. 1. Proof of Age (Xerox copy of SSC certificate). 2. Attested copy of the marks statement of X standard and Diploma Course. 5. Certificates issued by the concerned authorities in the case of Special categories like PH,NCC, SPORTS and CAP. 6. Three passport six photographs pasted on the application form. 7. Two self addressed envelopes with Rs.5/- postal stamps (for sending the hall ticket and rank card). 8. Demand draft bearing No., Dates for Rs.500/- (Rs.250/- in case of SC./ST/PH) drawn in favour of Comptroller, ANGRAU payable at Guntur. The filled in form should be sent by 22.06.2019 to the Convener, AGRICET-2019, Office of the Associate Director of Research, RARS, Tirupati 517502. The candidates may also submit their Application with a late fee of Rs.1000/- (Rupees one thousand only) for General Candidates and Rs.500/- (Rupees five hundred only) for SC,ST& PH candidates DD drawn in favour of Comptroller, ANGRAU, payable at Guntur from 25.06.2019 to 30.06.2019.